Ted has traveled the US working Outdoor Education and guiding rock and ice climbing for the past 15 years. He has worked for a number of different University level Adventure Education departments, engaging with and teaching students in mountainous regions from Alaska to California and to New Hampshire and beyond. Ted lives in Littleton, NH with his wife, one year old daughter and two Icelandic sheepdogs. 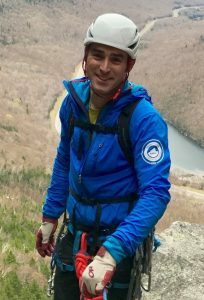 This location affords the opportunity to climb and teach on both the world class rock and ice of the White Mountains, and where he is the Director of Outdoor Education for The White Mountain School. Ted has taught the Alpine Mountaineering class at PSU since 2013.